The proper operation of the T.V.B.L. 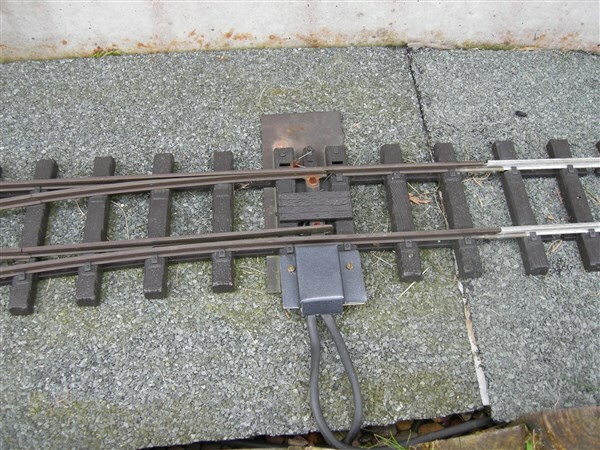 hinges on the changing of one set of points at the entry and exit of the balloon loop, so that 'Up' trains traverse anti-clockwise and 'Down' trains clockwise. Normally this would be simply a case of a trailed point, however here there is also a passing loop to consider, which was added later. The balloon loop joins at the start of the p/loop. 'Up' trains will also pass to the left side of the p/loop and down trains the right. 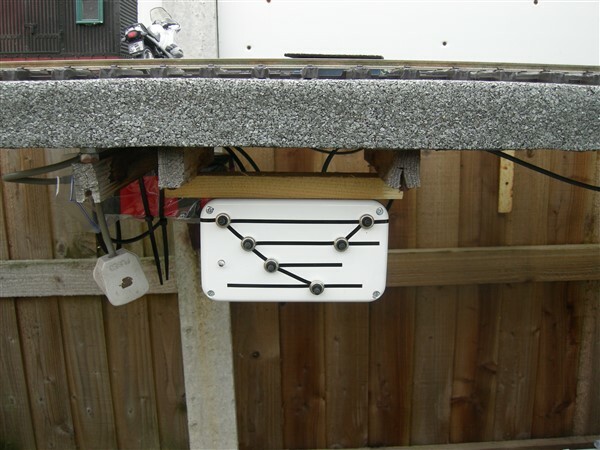 The original method was by a simple rod-linkage (just visible above) with bell-cranks. Unfortunately this linkage has suffered the ravages of the weather and the so-called stainless pivot links (aircraft type) proved to be only plated. The pivots then rusted and became very tight in the cranks making the whole thing unreliable. The thought was that it should be possible to motorise the b/loop point and leave the p/loop entry point sprung left. 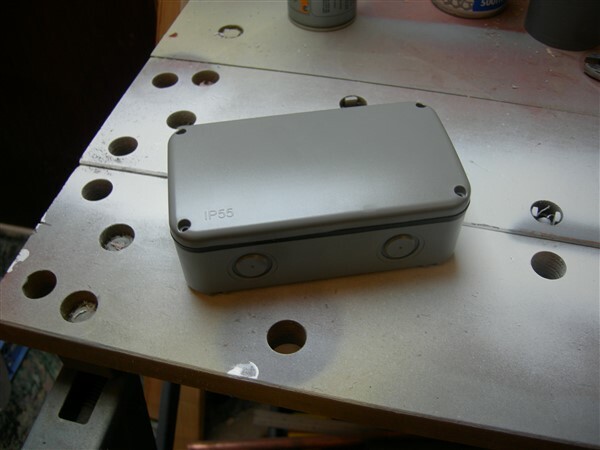 Getting power to the motor was possible with a very long lead so battery power was considered and thought possible with solar charging. 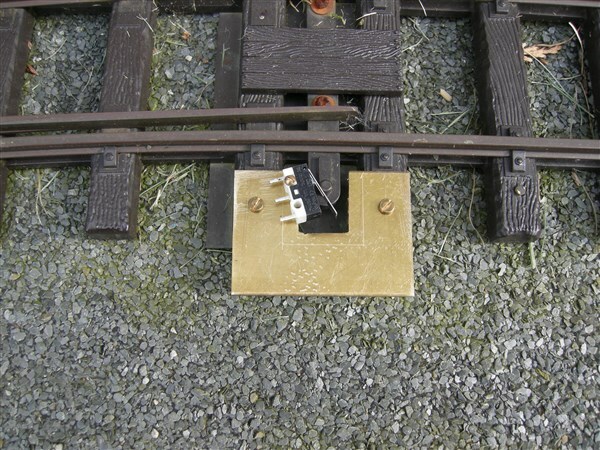 Not wanting to have to manually operate the point automation was required and therefore a micro-switch needed to be added to the p/loop entry point so that a 'Down' train would trip it as it exited the p/loop. The motorised point will trail from the b/loop, but if that proves unreliable a second micro-switch could be added to the p/loop exit point which is currently sprung right. The switch is mounted at an angle to increase its operating movement, it is also set 'hair-trigger' to give the longest 'closed' time though it seems more than adequate ATM. It has a clamp on the near end rather than another screw, so that future adjustment is possible. A minor problem is that my lightest waggon (W&L flat) isn't quite heavy enough to trigger it on its own, I may just add a touch of lead underneath, rather than mess with the spring weights, as it's very slight. The switch does add a little extra to the earlier spring. It's the passing loop point .. .. .. ..
Not wanting to be so bold as to suggest you should not be trying to teach US how to speak the Queens' English.. Let's face it, you lot can't even spell properly!! A bag of diodes, and a box of relays, should sort it.. I have the circuit of a dual-purpose 'inclusive always' or 'exclusive never' if you need one? The problem with relays is as you pointed out in another thread, coil impedance, when running on battery. It's a ways in the distance yet, too many other priorities. It is very simple. A counter clock does just that - counts. Usually downwards to zero.Google it. Maybe a job for an Arduino and some software. Problems can always be blamed on programming. At LAST!!!!! 'Tis now completed. All the upgrade of the point operation across the whole of the T.V.B.L. is up and working again, including the new Stockyard. 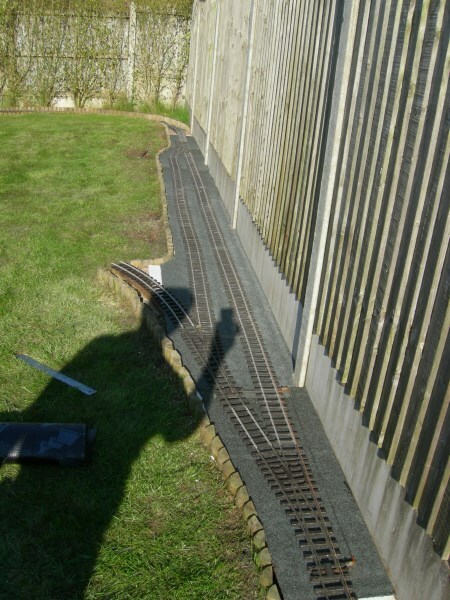 The terminus point-work had been modified, to release a point-set for the Stockyard. 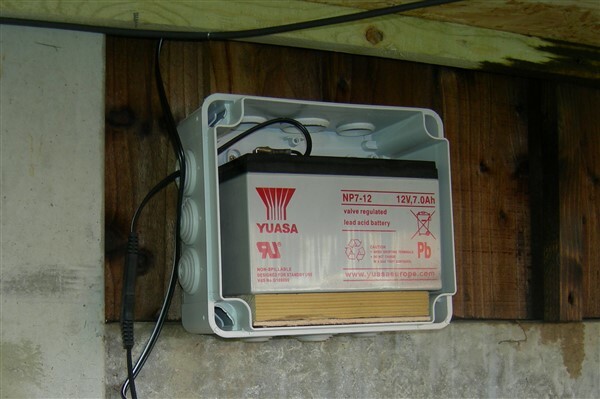 A solar battery saver (not full charger) has been connected to a 12V 7 AH battery. 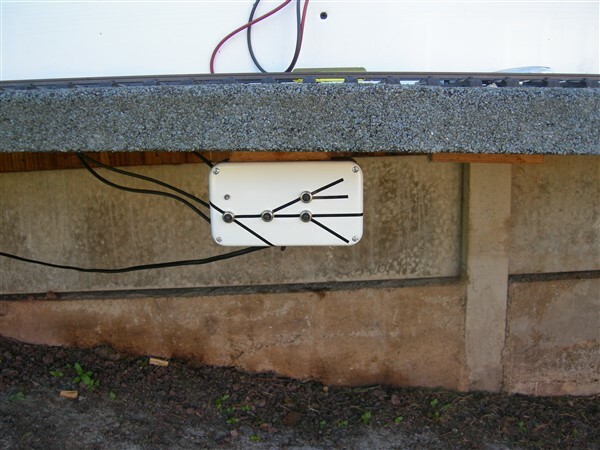 Rather than connect the battery directly to the automatic point mentioned above, the power is taken to what is essentially a Ground Frame, made from a double socket size junction box, which is damp proof (ish). Above is the Stockyard, and below the Terminus. Currently the power source at the Terminus is by LGB controller, but plans are already in the pipeline to convert this to Solar/Battery as well. 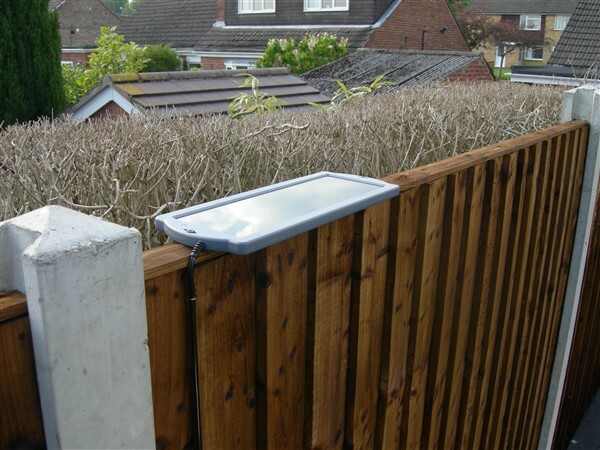 The Solar panel seems to be holding the battery at a steady 14.2V (on charge, cloud cover), sufficient for me to need to replace a burnt out LED because I calced the resistor for 12V!!! There should be more than enough surplice power to enable fitting a signalling system at a later date. Get off your horse and drink your milk, we have been at it a lot longer than you ex colonials! No sarcasm is intended, just pure ribbing.